I have made several references to Owners and Groups above, but have not yet told you how to assign or change the Owner and Group assigned to a file or directory. You use the chown command to change owner and group assignments, the syntax is simple chown owner:group filename, so to change the owner of file1 to user1 and the group to family you would enter chown user1:family file1. The setuid/setguid permissions are used to tell the system to run an executable as the owner with the owner\’s permissions. Be careful using setuid/setgid bits in permissions. If you incorrectly assign permissions to a file owned by root with the setuid/setgid bit set, then you can open your system to intrusion. You can only assign the setuid/setgid bit by explicitly defining permissions. The character for the setuid/setguid bit is s.
So do set the setuid/setguid bit on file2.sh you would issue the command chmod g+s file2.sh. You can only assign the sticky bit by explicitly defining permissions. The character for the sticky bit is t.
To some users of Mac- or Windows-based computers you don’t think about permissions, but those environments don’t focus so aggressively on user based rights on files unless you are in a corporate environment. But now you are running a Linux-based system and permission based security is simplified and can be easily used to restrict access as you please. 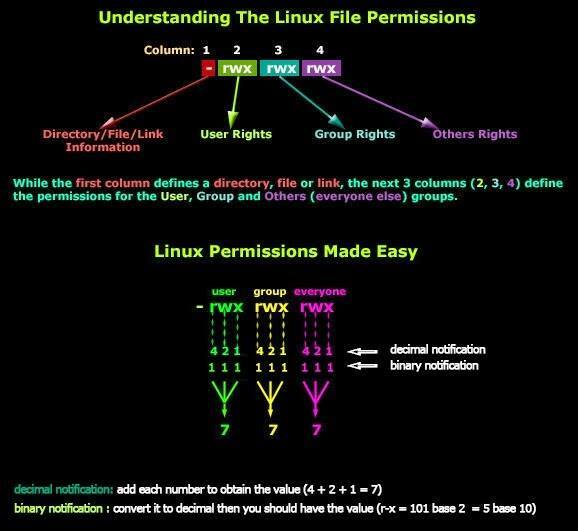 So I will show you some documents and folders that you want to focus on and show you how the optimal permissions should be set. home directories – The users\’ home directories are important because you do not want other users to be able to view and modify the files in another user\’s documents of desktop. To remedy this you will want the directory to have the drwx______ (700) permissions, so lets say we want to enforce the correct permissions on the user user1\’s home directory that can be done by issuing the command chmod 700 /home/user1. bootloader configuration files – If you decide to implement password to boot specific operating systems then you will want to remove read and write permissions from the configuration file from all users but root. To do you can change the permissions of the file to 700.
system and daemon configuration files – It is very important to restrict rights to system and daemon configuration files to restrict users from editing the contents, it may not be advisable to restrict read permissions, but restricting write permissions is a must. In these cases it may be best to modify the rights to 644.
firewall scripts – It may not always be necessary to block all users from reading the firewall file, but it is advisable to restrict the users from writing to the file. In this case the firewall script is run by the root user automatically on boot, so all other users need no rights, so you can assign the 700 permissions.